Amazing device helping disabled people walk Jump to media player The BBC's Nikki Fox went to test out the exoskeleton, which is an amazing device helping paralysed and disabled people to walk independently. Exoskeleton helps paralysed to walk Jump to media player Disability Affairs correspondent Nikki Fox reports on the development of exoskeleton technology which is helping those suffering from paralysis to walk again. Robotic skeleton aids stroke rehab Jump to media player Scientists at the Bristol Robotics Laboratory develop an "exoskeleton" to help improve hand movement following a stroke. 'Bionic' soldier learns to run again Jump to media player A soldier, paralysed by a sniper's bullet in Iraq, has learned to run again with the aid of bionic splints. 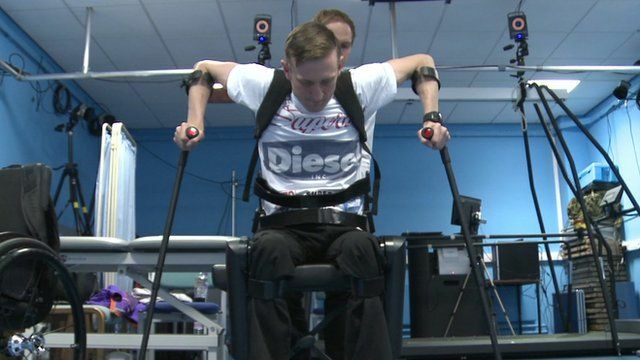 A former British soldier who was paralysed in Afghanistan is learning how to walk again with the help of an exoskeleton. James Johnson, who served with the Grenadier Guards, is the first paraplegic person to be part of the Salford University pilot scheme to teach people how to walk using robotics. In the past two years, exoskeletons have started to be sold commercially but they are expensive. The ReWalk system being used by Mr Johnson costs €60,000 ($66,541, £42,850). The company hopes insurance firms will help others with similar disabilities meet the cost of learning to walk again.